OP: An okay song. Sung by the same person (Iori Nomizu) as the opening of the first season. I was more impressed by some of the things shown in the animation sequence. For example the black and white Chaika silhouettes. I wonder what they mean? But yes, the song didn’t impress me. The opening of first season was more lively. ED: This song is better than the opening. Once again, it’s sung by the same people, but it is just as good as it was in the first season. The animation on the other hand is quite simple for the most part. At the very end, there are 2 blurred figures standing together. Pretty sure those are Tooru and Chaika. Possibly a romantic ending? Also those swords lying on the ground… My guess is that Tooru will either quit being a saboteur, or he will die. Voice acting: Can’t think of anybody who could give Chaika a better voice than she already has. Thank you, Chika Anzai! The siblings are also voiced well. The rest of the cast sounds quite similar to many other series, though. Sound: Of course the sound isn’t of the same quality as Fate/stay night, but it is still quite good and realistic. I really liked the OSTs during both Chaika’s battles against Claudia, because they raised the tension and gave a feeling of a real life-and-death battle, even though they were not. Visuals: The animation is smooth. The character designs have stayed the same as in the first season, which I like. The eyes look lovely. The rest of the visuals look rather simplistic, even though they don’t seem to lack much detail – but that has been the case since the beginning of the first season. 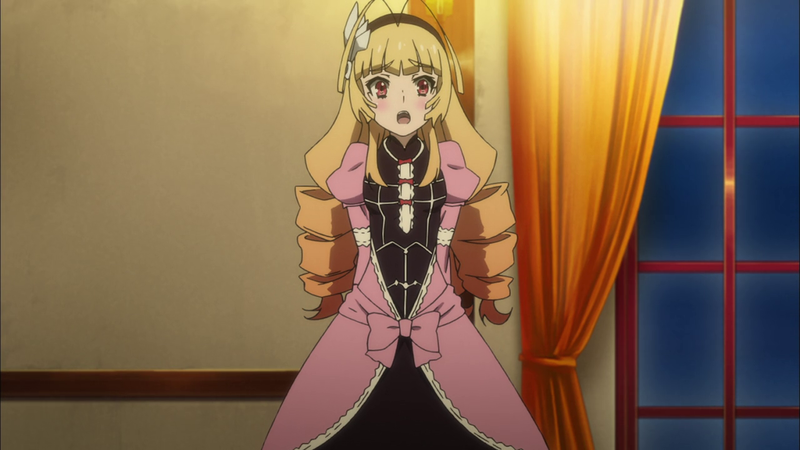 Characters: Most people who are reading this have probably seen Hitsugi no Chaika S1. Nevertheless, I want to remind you of the main cast. There’s Chaika – a mysterious girl who claims to be the daughter of a tyrannical magician emperor, who was killed by 8 heroes. She now goes around the world, collecting parts of her father’s body, accompanied by two saboteurs: Tooru and Akari. They often get into trouble, but so far have escaped every dangerous situation. They even found a fourth companion – Fredrika. She’s a dragoon (kind of like a dragon), and she is now considered a main character. Her personality made me like her as much as Chaika in the first part, so I’m glad we’ll be seeing more of her. She also seems to have developed deeper feeling for Tooru, constantly suggesting him to form a contract with her and become a dragoon cavalier. Vivi now has white hair and looks exactly like Chaika without all the gothic decorations. Yay, more Chaikas! Story: Some time has passed since the first season. Our main characters are now visiting another hero, Claudia, who is actually different from the rest. 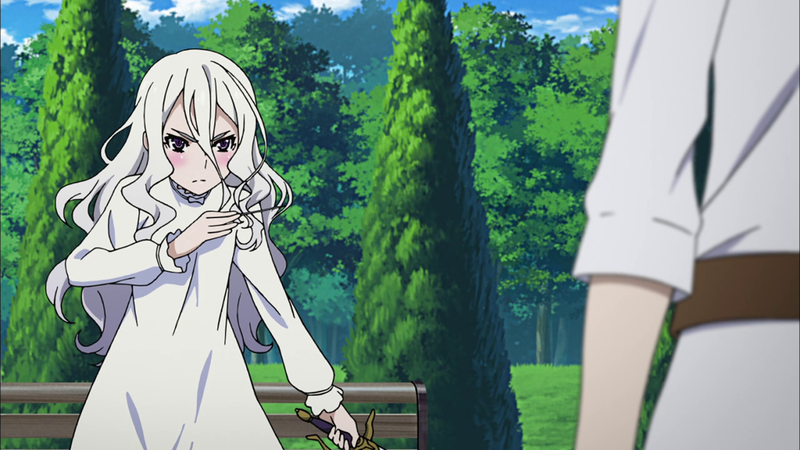 She is friendly and kind, and is almost willing to give Chaika what she came for. She has only one condition. Chaika must beat her in a battle. Even Tooru and Akira are allowed to help. Beating one of the 8 heroes isn’t that easy, though, and our team is still struggling. 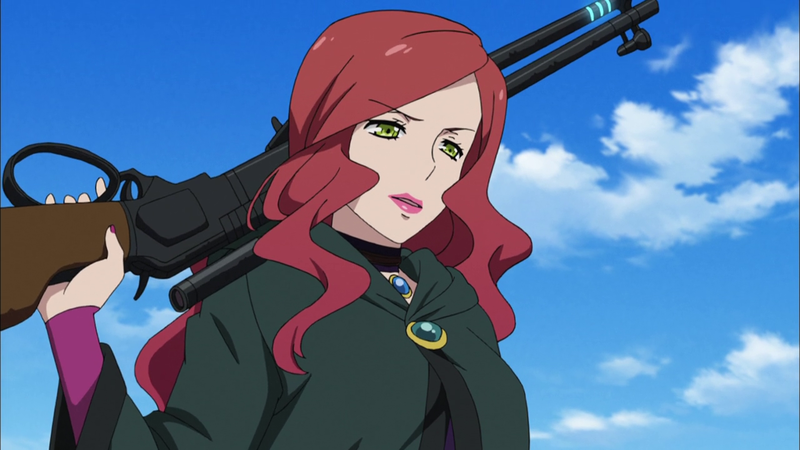 Meanwhile Vivi is very depressed over Gillette’s death, and refuses to accept herself as Chaika. When Guy appears in front of her, he says that she is now a half-Chaika. She would have fully transformed, but her friends stopped her. However, she is still good enough for accomplishing the mission of gathering the remains of the old emperor. With those words Guy leaves, and Vivi is left in despair. As I suspect, Tooru will finally accept Fredrika’s proposal and will become a dragoon cavalier. That’s just the logical power-up of the hero. He can’t possibly keep using the same Iron-Blood technique until the very end, right? That would be pretty lame (*cough* Kamijou Touma *cough*). Anyway, we are also briefly shown the end of the war against the old emperor, Arthur Gaz. We first see him talking about activating the plan involving Chaika. 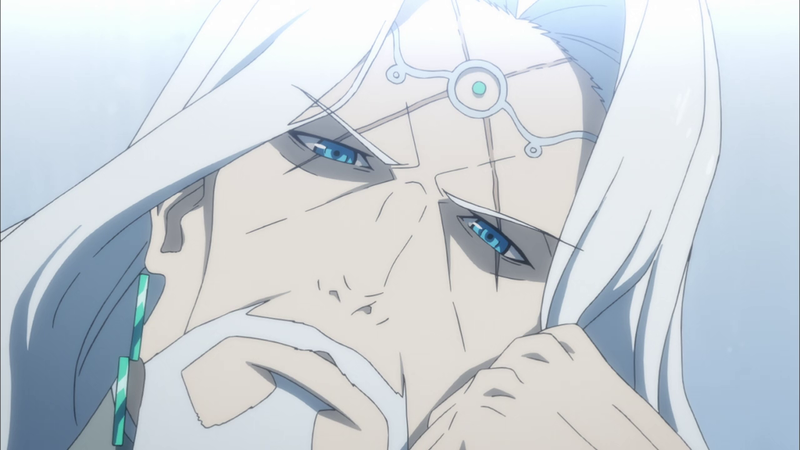 He already knows that he will die, and the “Chaika” plan is for his own sake. The anime then jumps some time forward, and emperor Gaz is seen being killed by the heroes. Conclusion: I have high hopes for this. I liked the first season, and am sure to watch this one as well. It might not be the same kind of hype that I’m feeling for Psycho-Pass and Fate/stay night, but it’s still up there. I still remember what I felt when watching the first few episodes of Hitsugi no Chaika on a weekly basis, and it makes me a bit hesitant. I didn’t like it back then. However, I believe the situation is different now, and Hitsugi no Chaika: Avenging Battle will not fail to deliver. Go Chaika, the Coffin Princess! 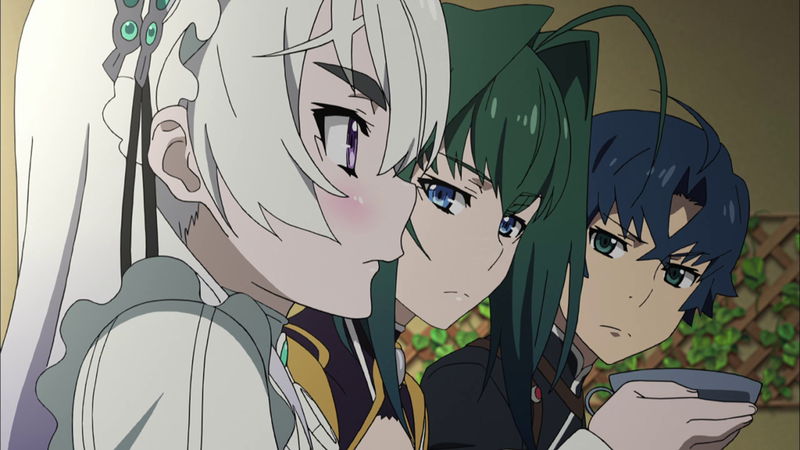 Posted on October 9, 2014, in Anime, First impressions, TV and tagged anime, avenging battle, chaika, coffin princess, fall 2014, first impression, hitsugi no chaika, magic, travel, TV. Bookmark the permalink. 2 Comments. Is this first season worth watching? I don’t think I’ll be able to catch up but I guess I’ll probably watch it as a backlog if it’s good. I can’t really say for sure if it’s worth it. Surely it’s not a bad anime. Otherwise I would not have finished it. But for example, I found the first season boring at first, which is also why I stopped watching it for a while. I’d say that if you like the premise, then it will be a good watch. Other than that, there is nothing that makes Hitsugi no Chaika special or stand out from the rest. If you like the first season, though, then you will like the sequel too (unless it will go downhill from here).